LAVERGNE, TN — Chinese-based company and Walmart supplier Sinomax will bring 350 new manufacturing jobs to Tennessee with its factory in LaVergne. The company plans to add 30 new employees each month. The move is part of Walmart’s 10 year initiative to source $250 billion more in products in the U.S.
Sinomax, a manufacturer of pillows and bed toppers and major Walmart supplier, opened the manufacturing location in LaVergne in 2016. The company has been a major supplier to Walmart for foam bedding products since 2006 and currently supply to roughly 3,500 stores. Walmart’s announcement of the initiative of adding $250 billion more in American made products comes just before President Donald Trump made a pledge to bring back “millions” of manufacturing jobs to the United States through a $1 trillion investment in infrastructure, along with a multi-billion dollar investment from the auto industry, during his address to Congress in February. 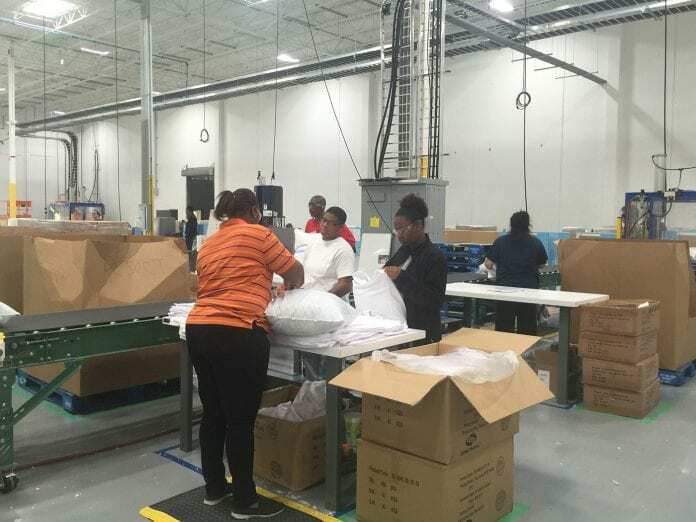 Frank Chen, CEO of Sinomax USA, said that all of the products were originally made in China and the company began making plans with Walmart in 2012 to open a manufacturing facility in the U.S. Sinomax designs and manufactures all of its own foam bedding. Chen began looking for potential factory sites in 2015, searching across eight states, ultimately selecting the location in LaVergne that used to be occupied by Whirlpool. The entire production process takes place at the Tennessee factory, including foam pouring, fabrication and packing. They began making products in LaVergne in spring of 2016. Walmart is in year four of the $250 billion commitment. “The ultimate impact is job creation across the US. The jobs that are created in manufacturing across communities that we serve is really healthy for Walmart,” Cindi Marsiglio, Walmart’s vice president of U.S. manufacturing, said. Marsiglio also commends Sinomax for transitioning from importing the raw materials for their products to manufacturing it themselves and selecting the location in Tennessee. “They really exemplified taking a risk, they picked a great location there in Tennessee that made it cost-effective for them,” she said. Sinomax estimates that 350 new jobs will be brought into the area with the LaVergne factory. Boston Consulting Group predicts that roughly 250,000 more direct manufacturing jobs will be available in the U.S. at the end of the 10th year. “That’s really what we were aiming for when we stepped into this initiative to really accelerate suppliers efforts, wrap resources around them and help them one by one find a way to bring that production closer to our Walmart customers,” Marsiglio said.